how to simulate the key send as the ahk L do in cpp? Hi, I am going to simulate key press in my cpp code directly. I use sendinput func in cpp, but is not work well. I don't know why sendinput just not worked in some window, even when I try the instructions mentioned on Stack Overflow to use the scancode. iit's a huge project, I don't know where to start. Anyone can give me some advice about the source code of ahk _L ? You could load that libary from your C code, then simply call AHK's send function from your C code. Re: how to simulate the key send as the ahk L do in cpp? thx for your timely reply, but I get some problem when call the dll from cpp. 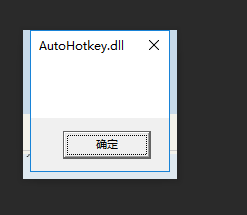 Here is my code, I copy it from this link : https://autohotkey.com/board/topic/39588-autohotkeydll/://autohotkey.com/board/topic/39588-autohotkeydll/page-28?&#entry418330, written by hotkeyit. and download the dll from : https://codeload.github.com/HotKeyIt/ahkdll-v2-release/zip/master.
. Empty msgbox without text "ahk". If I change the msgbox ahk to "send test", nothing happens. So how to call the dll properly? Tnx. tnx my bro, the code worked. How do you know the difference where can I get the manual of how to use it. V2 is better than V1? Any examples for V2? Thank you again. If all you want to do is send keys, then v1 or v2 will make no real difference I don't think. what should I do if I want to use the wingetpos function, how to get the outputvar? sorry to asking you so many questions but these things really tough to get through google. One more question, how to make two ahk stament in a dll call. I try to call the dll twice like this, but the coordmode won't changed when click the mouse. AHKExec is more for executing one-off code. It may well be fine for what you want - to run multiple commands, you probably just have to add newlines. If you want to start a proper AHK thread, you probably want ahkThread. Here, AHK is the calling language, but the way you initialize and communicate with the thread should basically be the same.